The expectation for sophomore quarterback Justin Fields has been the same for awhile now. It has been the same since he officially announced his transfer to Ohio State on Jan. 4. It has been the same since his waiver to play immediately went through on Feb. 8. It has been the same since right now, as Fields currently ranks No. 3 in Heisman Trophy odds according to Bovada. Fields has not only been expected to win the starting job, but to perform as one of the best players in college football, even before having an official collegiate start. This one wasn’t official, but Fields earned a start in Ohio State’s Spring Game, and the result was somewhat of a mixed bag, something Fields can agree with. While splitting reps with redshirt freshman quarterback Matthew Baldwin on Team Gray, Fields completed 4-of-13 passes for 131 yards and a touchdown, while earning 38 yards and another score on the ground. Fields was behind center for four of Team Gray’s five scoring drives, one of which concluded with a 98-yard throw from Fields to senior wide receiver Binjimen Victor. For Day, a throw like that was not enough for him to name a starter, or even a leader, at the quarterback position. The position remains open, but the expectation for Fields to take it remains the same. Fields, a former five-star prospect out of high school, has always had these expectations behind him, and the Spring Game’s result does not change that. Even as a frontrunner to become the starter, Fields will have to live up to the season that Dwayne Haskins had a year prior, in which he threw for more touchdowns than any quarterback in Ohio State history, leading the Buckeyes to 13 wins and a Rose Bowl victory. But Fields does not worry about that comparison. Instead, the sophomore quarterback said his worry is simply to become a better version of himself. Haskins and Fields entered Ohio Stadium together with Haskins holding an arm over Fields’ shoulder. 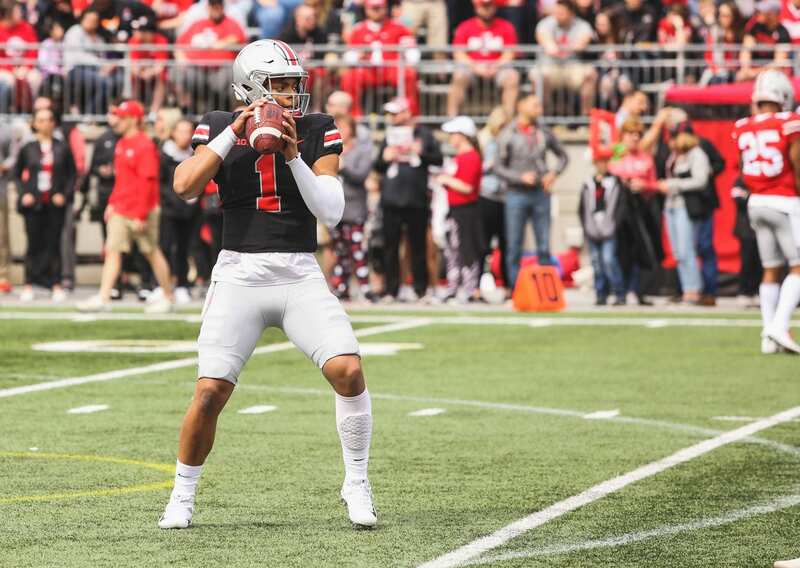 Fields said Haskins was his “boy,” and that Ohio State’s most prolific passer in program history was just giving him advice heading into the Spring Game. For Fields, who only completed 30.7 percent of his throws in his first time inside his home stadium, the advice could have been plenty of things. But with less than five months separating him and Ohio State from its first real matchup, there is plenty of room to grow, with Day calling the quarterback position one of his biggest question marks heading into the summer. Fields remains confident, not only in himself, but in his team. He said to take the starting job, he will have to “become a great leader on the team,” which includes being a more vocal leader for the group. But as far as his talent, which has been highly touted since high school and highly anticipated by Ohio State fans for months, Fields knows he can make those leaps needed to reach those expectations. “I feel like I’ve only scratched the surface,” Fields said.